Home » World » Asia-pacific » Japan’s Maglev Train Sets New World Record @ 603kph (373mph)! Japan, a country which is already synonymous with fast train is breaking barrier after barrier in pushing the limits of train speed. 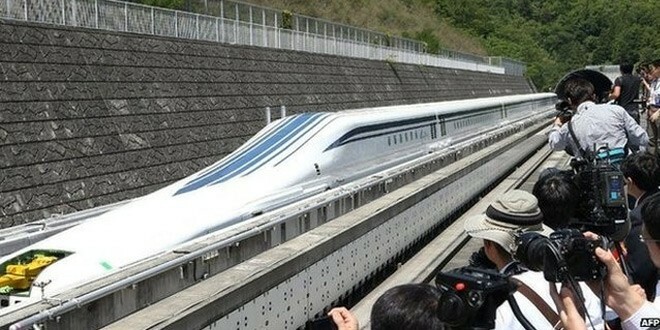 In yet another achievement Maglev Train broke all previous records by clocking speeds over 600kph (373mph) in a test run. Guess what? This train just broke its own record from just a week before when it clocked in 590kph again breaking its previous record in 2003 at 581kph. The Maglev Train which is short for “Margnetic Levitation” does not have levels and it levitates magnetically from the tracks and is propelled by electrically charged magnets. With absolutely Zero Friction with the tracks this train limits seems only seems to be gravity and its own weight. The challenge for the Japan Railway Central company is to have a train in service in 2027 to travel some 286km between Tokyo and the central city of Nagoya. The service, which would run at a top cosmic speed of 500kph, is expected to connect the two cities in 40 minutes. It’s less than half the present journey time for the Shinkansen bullet trains. Japan wants to sell its Shinkansen bullet and magnetic train systems overseas to revive the country’s economy, partly through infrastructure exports. Prime Minister Shinzo Abe is likely to push the technology for a high-speed rail link between New York and Washington during his upcoming visit to America this weekend. Next: Tesco Books In An Epic £6.4bn loss!